Burning Moon's Inside advice: Paramore Art Works Giveaway & Review! It is the time of year when all the stores are starting to stock their Halloween goods and pumpkin spiced products are making their way into your carts. There are 67 days until Halloween, a lot of people won't start worrying about costumes and such for another month or so but why not get a head start? My fiance and I like hosting Halloween parties every year and this year will be twice as special because we will be getting married as well so I am looking for new decorations to add to our collection this year. 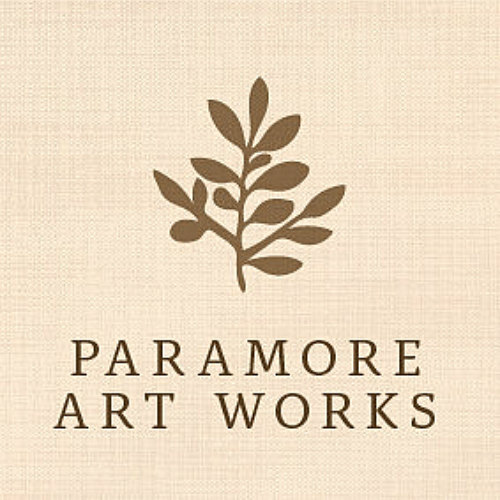 I recently happened upon an Etsy shop called Paramore Art Works that sells a beautiful selection of banners and other goods. Shop owner Beth was kind enough to send me a tan and black "Happy Halloween" banner to review. Shipping was speedy and the banner was well packaged it came wrapped in an adorable fall tissue paper and placed inside of a cello bag with a ribbon. It arrives in two sections one says "Happy" and the second says "Halloween" so you can arrange them as shown above, hanging these up made me realize that without someone to guide where I am hanging this I am absolutely horrible at trying to get it centered and even. Each letter is made with a thick chipboard with black lettering, the chipboard makes each letter pretty durable and I see this banner lasting for many years to come. The banner is eye catching and the perfect size for any home, height wise each letter is a little longer than the length of my hand and width wise the "Happy" is 22" long and "Halloween" is 39" long. I didn't find any issues with the lettering for the cuts of the chipboard, everything was even and flush. I also love how easy these are to fold back up into a stack for storage, I can never get the poor paper like banners from the store to refold up how they should because of how they are made so this made me very happy. The banners are also light weight so you can hang them pretty much any where, I plan on hanging these in my kitchen above my kitchen island which will greet guests as they walk into the house. Each banner set is $25 which to me is very reasonable, it is handmade and like I mentioned before I feel like this banner will be long lasting. 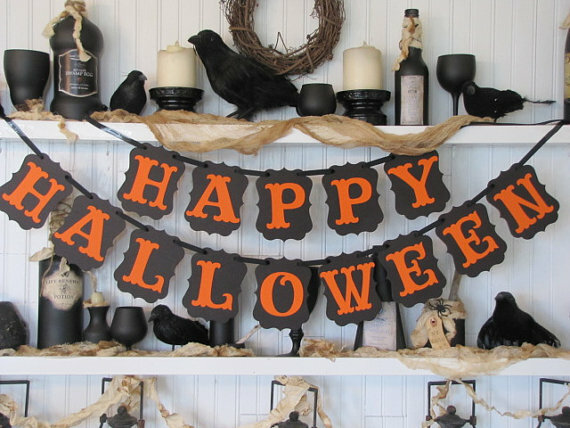 To me it feels like the banner helps bring a touch of vintage Halloween into decorating because of the colors and lettering, a lot of Halloween decorations now a days are a little too cutesy so I like that this can fit into a wide range of decor. *The image above was not taken by me, it is an image pulled from the Paramore Art Works Etsy page. One lucky winner is going to receive a black and orange "Happy Halloween" banner like the one shown above. 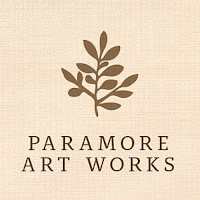 Giveaway entry question: What is another banner from Paramore Art Works would you like to own? I'd love a custom name banner in black with white letters for my girl! I would love to win the black and orange "Happy Halloween" banner for my dinner room! We do tons of get together sandbox would loooove to show it off!! Their give thanks banner is perfect for Thanksgiving! I like the custom name birthday banner. PIE BAR Banner is so cute love all of them! I really like the Let It Snow banners! I'd also like to own the JUST MARRIED Wedding Banner. I like the Happy Birthday Banner. Like the Happy Birthday banner. I would love the GIVE THANKS banner! I would love the Love is sweet banner! The orange and black "trick or treat" is amazing. I like the Merry Christmas banner. I like the HOMECOMING 2017 Banner. It would be great to take pictures of my daughter and her friends with this! I like the Give Thanks banner. I would like the Give Thanks banner. I also enjoy the Christmas banners. I love the orange trick or treat banner! Another banner I like is the black and whitr HAPPY BIRTHDAY Banner. I would like the CONGRATULATIONS Banner, Congratulations Sign, Wedding Sign, Anniversary Sign, Graduation, Congrats. I like the MR and MRS Wedding Banner, Wedding Sign, Mr and Mrs Chair Sign, Engagement Photos, Wedding Decoration. I also like the Christmas banner.